I tend to appreciate 'cosy' small pubs but blimey it is so dark in here you practically need a bloody torch to find a table. Clearly a thriving pub though as it was absolutely packed on an ordinary THursday evening. Beer good. 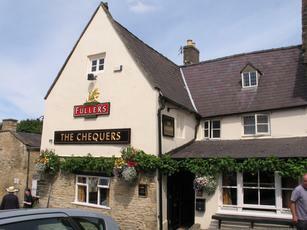 Chequers was my favourite pub out of 8 I tried in North Oxfordshire yesterday. It has deservedly won the local CAMRA pub of the year competition. I wouldn't normally be so enthusiastic about a Fullers pub. But this was has a nice market town location and a warm and unspoilt interior, with much charm. Beers on yesterday were all from the Fullers range - Sticky Wicket, Wild River, London Pride, London Porter, ESB & Gales HSB. Whilst I was a little disappointed to see a lack of guest beers (I believe they normally stock 1 or 2), I was happy to see the London Porter available on cask for once. It's generally only a keg or bottle offering. The bar staff were very knowledgeable and friendly. It was quite busy and most of the customers were of the younger variety. It is nice to see them continuing to enjoy a great example of a British pub, as opposed to a soulless bar. Chequers is very much recommeded by me. Appealing Fuller's pub, with an attractive rustic wooden interior spread over numerous small rooms and snugs. Large inglenook fireplace which would make for an extremely cosy winter venue when lit. Very good selection of Fuller's beers (no non tied ales) which were in good condition. I thought the food was a bit disappointing - the beef roast was rather gristly and came swimming in creamy horseradish and water-like gravy. My steak (�15) was ok but tiny. At �40 for two mains, one desert and a few pints, I'd expect better.